I received an e-mail yesterday from “Joyce” who said I had printed the wrong dosage for Imodium and dogs in this article about doggie diarrhea. Panicked, I rushed to double-check right away, and found that I had NOT listed the wrong dosage… Whew! Her confusion lies in the fact that I mentioned the dosage for liquid medications in milliliters (ml), whereas others (including a site I actually linked to in that article) sometimes mention the dosage for solid medications (i.e. pills) in milligrams (mg). UPDATE: There’s a new “important note” about Imodium below. For some reason, my dogs have always been more receptive to liquid forms of medicine, rather than pills. No matter what I try to “hide” the pill in, they find it and spit it right out. Whereas with liquid meds, I just mix it in cottage cheese (which they rarely get, so they think it’s a special treat …or sometimes I even mix it in their own dog food gravy), and they never even know it’s there! Which brings to light the fact that it’s imperative that you closely double-check dosing information before dispensing any human medications to your pets. While there rarely is a difference in the effectiveness of liquid vs solid medications, there is a huge difference in dosages if you happened to mistake mg’s (milligrams) for ml’s (milliliters). Here’s a great online conversion tool for measuring things by volume or by weight. 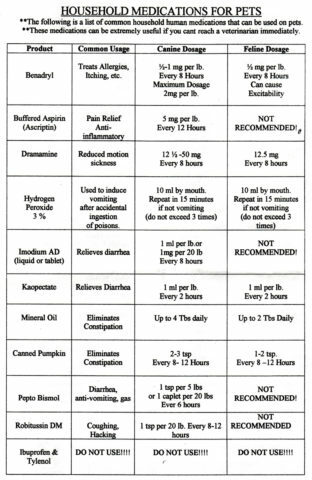 The following chart of acceptable household medications for pets came directly from my veterinarian. This list has been a lifesaver for me. It has saved me lots of unnecessary trips to the vet, when I could simply provide some pet-friendly doses of over-the-counter medications that we already had on hand. The human medicine we use most frequently with our dog is Benadryl. IMPORTANT NOTE: Before giving your dog Imodium, please see the updated pet dosage information from a pharmacist, and from a veterinarian, and from other pet experts! The addition of Robitussin DM to relieve a hacking cough. Also, according to a comment at the end of this article, the brand name Kaopectate no longer contains kaolin and pectin. It now contains bismuth salicylates and absolutely is not safe for cats. To the items listed on the above lists, I would add: Neosporin, Artificial Tears, and Hydrocortizone creams, gels and sprays — as discussed here. 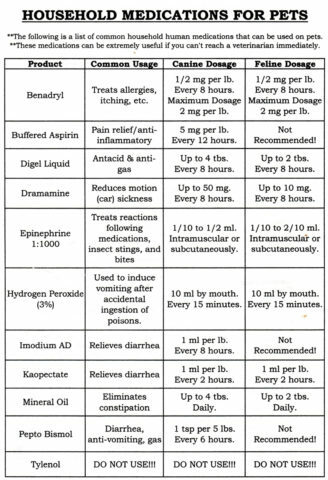 Here’s another (similar) chart showing household emergency medications for pets. Here’s a list of human antibiotics that are safe for dogs. 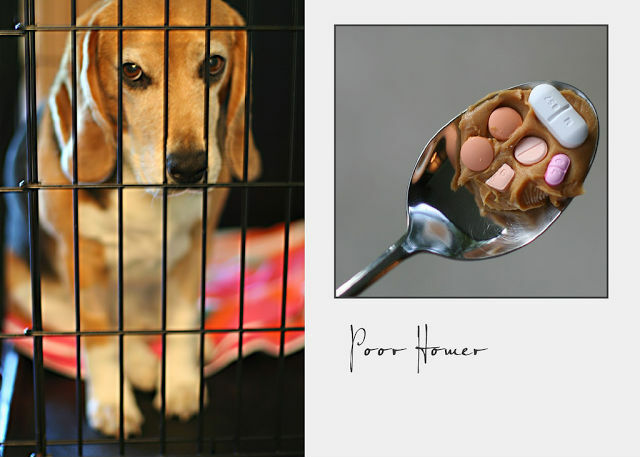 Here is the ASPCA’s list of the top 10 human medications that are NOT safe for pets. Here’s the Animal Poison Control Center’s top 10 human medications that can harm pets if ingested. One important thing to note here is… you should call your vet before giving your pet any of these meds for the first time. So your dog’s health chart always stays up-to-date with all major and minor ailments through the years. To make sure that the meds are still a-okay according to the latest findings (and dosages) regarding animal health and human medications, and that they won’t interfere with other meds your dog may already be taking.